Editors Note: Highlighted links in the article are primarily to photos associated with the text. On a few occasions the (bold) text links are to informational pages concerning the text. NONE are to advertising links. My Polynesian adventure begins with the steps leading out my back door, down the alley, and out to the bus stop at Colfax and Clarkson to catch a 5:55 a.m. #7 to rendezvous with a 6:12 Skyride to Denver International Airport (DEN) for an 8:30 American Airlines flight to Los Angeles. The Skyride offers easy and inexpensive transportation to DEN from the downtown Market Street Station and several Park-n-Ride locations and stations around the metro area. Round-trip tickets purchased in advance are $18; individual rides paid on the coach are $10 (exact change only). The American flight arrives on time, giving me three-plus hours at LAX to get my bags and transit to the Tom Bradley international terminal for my 1 p.m. Air Tahiti Nui (ATN) flight to Tahiti. My paperless check-in with Air Tahiti Nui goes smoothly. I ask if the other journalists from the press trip have checked in, and I am assured that they have and are seated in my row. At the gate I play “can you spot the other journalists.” I spy a couple of likely looking groups before we are called to board. Air Tahiti Nui’s boarding procedure defies logic. Passengers are called to board in groups based upon seat number, but rather than immediately boarding the plane, passengers are herded onto a bus, which jumbles everyone up, effectively invalidating the section-segregation procedure. Buses shuttle passengers to an open-air boarding area, and it becomes a mad scramble to get on the plane. Only the first- and business-class passengers are spared the free-for-all, boarding via a forward cabin entrance. As departure time approaches and the flight attendants go down the aisle closing the overheads, several realizations settle upon me: 1) I have yet to meet Jana, the leader of the press trip, or any of the other journalists, and 2) I am flying to Tahiti and I have no idea where I am staying or who is meeting me or if I even have passage on the freighter. YIKES!!! I contact a flight attendant to see if Jana is in fact on the plane. The FA politely informs me once we are airborne he’ll have time to check the manifest to see where she is seated. This does little to lessen my anxiety, but reason suggests I’m on the plane and already committed. Nothing left to do but relax. I guess this passes for adventure travel at this stage of my life. As final preparations for departure are made, three women come up the far aisle and one gestures toward me. Jana smiles and introduces herself, Joyce, and Brooke across the empty row before they continue on to their seats. The seating configuration in the Air Tahiti Nui A340-300 Airbus economy class is quite tight for my six-foot-two and, shall we say, athletic frame. Fortunately, I have the entire center row to myself. Our very stylish and attractive flight crew serve a selection of complimentary drinks including wine, beer , and champagne before dinner and still manage three uniform changes during the eight-and-a-half-hour flight from L.A. to Papeete, Tahiti. Our choices for hot meals are oven-baked chicken thigh with barbecue sauce, rice, and vegetables, or Tilapia with turmeric cream sauce and stir-fried noodles. Both meals are accompanied by cheese and chocolate-coconut mousse cake. I have the Tilapia, which is quite good. About two hours out from Papeete, the cabin lights come up and the flight crew passes through with a light meal of fruit salad, a turkey and cheese sandwich, coconut-pineapple coleslaw, and a cookie. Arriving on time, we exit from the plane into Tahiti's ripe and humid evening air. The strains of a Polynesian welcome band greet our arrival as a lovely Polynesian woman hands me the first of many Tiare blossoms I’ll receive during my two weeks in French Polynesia. I grab a luggage cart (free) and pass through customs surprisingly fast. The driver of the ground transportation arranged for us by Tahiti Tourism is waiting for us with welcoming flower necklaces called hei in Tahitian It’s a quick transit to the Sofitel Hotel, but unfortunately a very long check-in. My room is pleasant and has a hot pot for instant coffee and tea, a minibar, and Internet access for 850 XPF (US$9) per hour. My major complaint is the bathroom, where the design of the shower enclosure allows the entire bathroom floor to become wet. After a quick shower/flood I am out the door and down to the poolside bar for a drink with my fellow travelers. We share a fried appetizer plate and I have a Tahitian beer called Tabu. It looks like there’s a band playing near the pool , but it turns out that it’s karaoke night. There is some good talent staying at the Sofitel. In the morning I take an early walk around the hotel. The breakfast buffet is being set up in the open-air dining area just off the pool. From the beach , the view across the water is quintessential Tahiti : Sailboats rock on their moorings, a row of over-the-water thatched-roof bungalows catches the sunlight, and the eerie gray-blue outline of the mountains of Moorea looms in the distance. 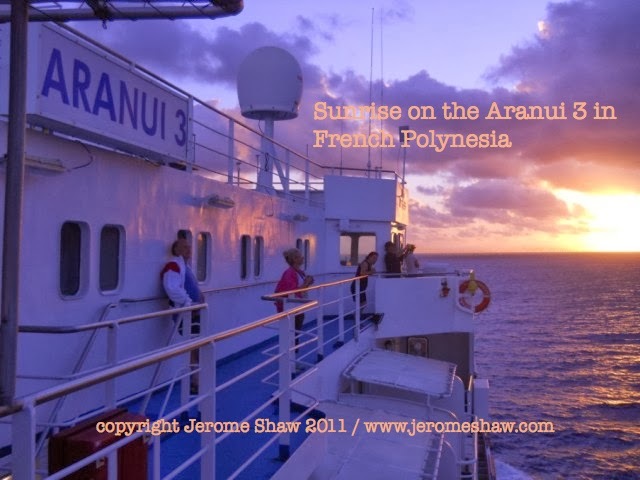 Our transfer to the harbor to board the Aranui 3 arrives promptly at 7 a.m. We drive through the main commercial core of Papeete and past the dock where the large Pacific cruise ships dock. This is the first hint of the differences between traveling on the Aranui 3 and the standard cruise ships. The Aranui departs from the working side of the harbor, along with the other cargo hauling ships. In the shadow of the Aranui a tall, cheerful woman from the ship greets us and inscribes “A44″ on my bags with white chalk. The ship is not leaving the dock until 10:30 a.m., so Jana, Brooke, and I catch a ride with our transfer driver back to the shops in Papeete for a look around. Even at 8 a.m., many of the shops are already open and the market center of Papeete bustles cruise-ship docks from the shops. Groups of old men, some bare-chested and others in colorful island shirts, gather in the shade at the corner benches. First we look for a place to change money. It is Saturday and the banks are not open, but the ATM is working. We walk through the two-story market. Here you can buy most anything , from exotic fruits to souvenirs. We find a corner shop that changes dollars. I purchase a couple of half-liter Cokes that cost me more than $2 a piece, which seems a bit pricey, but I later learn it’s a fair price here in French Polynesia. It is time to board. We climb the metal gangway and enter the reception area of the ship. We were already checked in, but had not yet received our keys. My cabin, A44, is one level down; my luggage is waiting outside the door. My cabin is nicely appointed and quite spacious. There are two single beds with storage space and drawers under the beds. There is a desk, a closet/cabinet, a video monitor, and a bedside table/drawer. The toilet is small but efficient with a curtained shower. While the ship runs 240-volt electricity with European-style plugs, there is a 110-volt outlet above the bathroom sink designated “shavers only.” I manage to charge my camera batteries and AA batteries using this outlet, but it was not a quick process. At the start of a cruise, it’s always a challenge to learn your way around a ship, even a small one like the Aranui, but eventually the ship becomes a familiar home. I locate a great vantage point to observe all of the activities on the dock surrounding the ship’s departure. The freight has been loaded, and workmen break down the roof of the temporary building used to sort and store the freight. Many locals are there to say goodbye to family members that are traveling on the Aranui to return to the Marquesas. Others are there to wish bon voyage to crew members that spend two weeks of every month out to sea. Many passengers congregated near the bridge to watch the captain and his crew prepare to take the Aranui 3 off the dock, through Papeete Harbor , and out to sea for the first leg of our voyage. The moment finally arrives. Lines are untied, pilot boats swarm, and the Aranui 3 slowly slides away from the quay and begins an agile arc that brings it out of the harbor and into open water. Clouds drift around the peaks. We watch the steep green ridges above Papeete recede until all of the man-made scars disappear from the volcanic slopes of Tahiti Nui’s mountains. Moorea’s jagged peaks come closer before they too become faint as we roll onto our east-northeasterly course toward Fakarava, one of the dozens of atolls that comprise the Tuamotu Archipelago. We’ll sail the rest of the day and through the night to arrive on Sunday morning in time for church on Fakarava. This sounds like a great start to the cruise. YoYo, the bare-chested, pareu -clad bartender, ladles cup after cup of punch. The conviviality rises, plates of seasoned peanuts and marinated olives are eaten, and introductions are made. Our first onboard lunch is at noon; then we will be free to spend time sorting things in our cabin or further exploring the ship, finding that perfect lounge chair on deck, or taking a quick dip in the sloshing, swaying pool. I had expected that I’d have time for naps on days at sea, but in the end it happens that today is the only day that I manage a nap. Waking just before dinner—or more precisely, halfway through dinner—I struggle to answer even the simplest questions from my dinner companions. By dessert I can finally remember my name and the names of most of my dining companions. After dinner we climb the stairs to the ship’s bar and have an after-dinner Hinano, the ubiquitous Tahitian beer (380 XPF = US$4) and take a few photos in the bar to commemorate our first night on the Aranui. 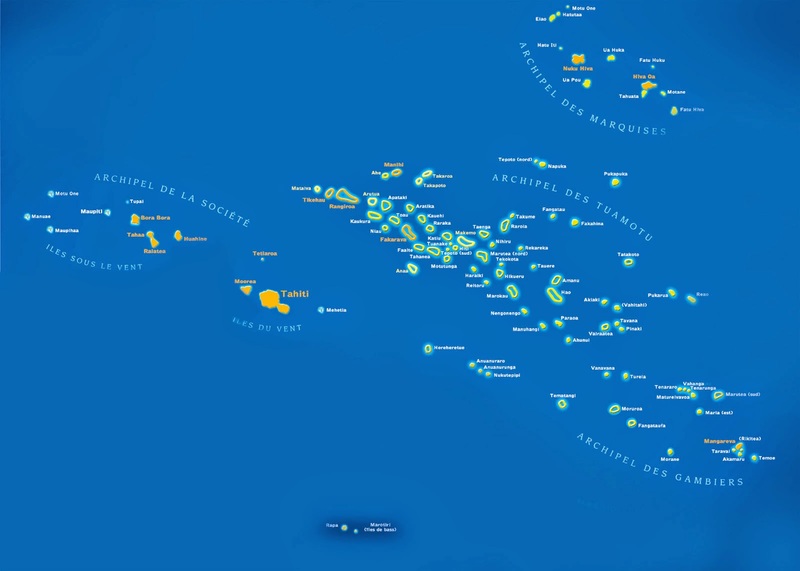 A map of Tahiti and French Polynesia. above center on this map. At 5:00 a.m. it’s very quiet on the decks, and today there’s not much to see on the horizon in the dim light of pre-dawn. 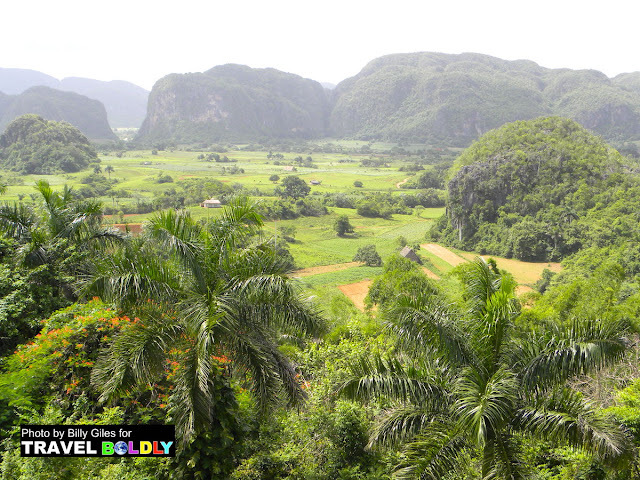 Eventually, a flat spit of land with palm trees comes into view. This is Fakarava, our Sunday-morning respite from the ship. Breakfast begins at 6:30 a.m. The breakfast buffet is varied. To my disappointment there is no mango, but plenty of other fruit: pomelo, watermelon, cantaloupe, bananas, and, strangely, canned peaches. In addition to toast, croissants, sausages, cold cuts, cheese, three types of cold cereal, two types of juice, coffee, tea, hot chocolate, and, occasionally, Milo, you can order eggs any style. After breakfast it’s time to don a life jacket and board one of the flat-bottom barges that look a bit like the landing craft used during the beach invasions of World War II. I wonder if the people of these islands feel invaded when we land on their beaches? The sky is still a bit grim for a beach day, but no one seems to mind. The strong-armed crew members physically guide everyone from the gangway onto the barge—even a guy my size gets manhandled. Manarii, an ever-present energetic crew member, gives a bon voyage smile and wave as we drift away from the ship. The barge’s props catch and we swing towards shore. On our approach to the pier, the water goes from the stern black-blue of deep water to the warm, inviting aqua shades of a shallow tropical reef. Fakarava is the second largest atoll in the Tuamotus group of islands and atolls, sparsely populated (population 850), and 250 miles (400 km) from the Society island of Tahiti. The lagoon is rimmed by a rectangular donut of reef with a north and south inlet. There are palm-fringed strips of low land called motu mostly along the north and east side of the atoll. Many from the first boat head straight for the beach to snorkel. Others veer right, to the cement street, reportedly built for a French president’s visit that never came to pass, that runs through the village of Rotoava. I go for a swim and step carefully through the shallow waters. Water shoes are recommended for most of the beaches we’ll be visiting because of Stonefish and sharp coral. I would be snorkeling, but I was not quick enough to get one of the limited number of fins and snorkels available from the reception desk on the Aranui. TIP: If you want snorkeling gear, grab it when you check in, or bring your own. While we are recreating, the Aranui 3 is performing its main function, delivering supplies to the island. Barges and whale boats make trips to shore full of the necessities of life and luxury items that are unloaded to the dock and then moved to cars and trucks for the short trip to shops and homes. I walk back down the cement road past the slick-looking storefront of Dream Pearls, which is open in honor of our visit, and then past a kinesitherapie office, which is not. A sight that in the U.S. is a relic from the past century catches my eye. A silver metal and glass box with a bright-blue pay phone stands out against the tropical background. The village seems mostly deserted until I get close to a small church. I linger outside listening to the music as it drifts out of the small squat cement-block building. The service ends as I am standing there, and several young girls in white dresses come out of the church and down the steps. A smiling well-dressed man helps organize the children into a coalesced group for a photo. I come across another photo op a bit further down the street, where a young boy revolves self-consciously around a light pole. I ask him for un foto s’il vous plaît. He nods his approval. An endearing squint-eyed, mouth-puckered smile creeps across his face as I take several photos and then thank him with my own squint-eyed smile and a mangled merci. At the perfectly maintained blindingly white , red-roofed Catholic church, a black dog lolls in the sun on the green grass. Looking in the open door, I am surprised by an island blue canopy-like interior . A woman fans herself while the singing continues. It is gospel music with a Polynesian twang. The singing stops, but the Polynesian guitar strains continue. Both foreign and familiar, the sacraments of Sunday morning are being observed here on this strip of soil-topped coral. The view out the front door is reason enough to envy these parishioners. Once every three weeks, they warmly welcome the invasion of dozens of interlopers into their idyllic Sunday rituals. I realize that I’ve not been watching the time very carefully, and only 10 minutes remain until the barges begin leaving. I am well down the cement road and it’s time to step lively to make it back before the last barge departs. But even with limited time, I can’t resist taking a few more photos of flowers and a too-red bicycle . With the barge and a throng of orange-breasted Aranui passengers in sight, I grab one last photo of two boys bicycle on a bicycle. Three minutes later I am on the barge headed back to the Aranui for lunch. The Aranui pulls up anchor, and after threading our way past the atolls of Kauehi and Aratiki we’ll be at sea and out of sight of land for the next 40 hours. It’s time to relax. But if you think that you’ll be bored on board, you’re wrong. If you want to get some quiet time for lounging and reading, you’ll have to scratch things from your social calendar like tonight’s Polynesian dance class, tomorrow’s fashion show, and the premiere performance of this voyage’s incarnation of the Aranui Band . And, maybe skip a meal or two. The food at lunch is light and tasty, with the air of being healthy, and is always accompanied by nap tonic, otherwise known as a bottle of wine. A couple of hours of hiking and swimming have piqued my appetite. Lunch is an hour-plus affair, especially on days when we are at sea. Whatever ambitions I began today with are erased by a full stomach and several glasses of wine. Each table of four is furnished with a bottle of French wine; after that is gone you may request more by the glass. During the voyage I tried to find the end of the “wine by glass” threshold but failed. It seems the only impediment to drinking too much wine with lunch or dinner is the patience of your smiling server. There is nothing on my schedule for the rest of the afternoon except a book, a lounge chair, and some sun. I slather on sunscreen and try to nap in the sun, but even a wine-laden lunch will not let me get comfortable on the Aranui‘s hard plastic deck loungers. There is some rolling during this time in the open ocean, but on this trip the ship’s motion is very mild. Tonight is the debut of the Aranui Band. The bar is packed. The drinks flow. Conversations start. The band arranges itself at the side of the bar and the music begins. Gwen, a delightfully cheerful passenger from Australia, is drafted as a band member. I suppose that she is chosen for her musical ability, but I’m shocked to learn that she has never plucked the strings of a ukulele before. She fooled us all and kept right up with the other members of the band in energetic renditions of old favorites and Polynesian tunes. We’ll be at sea all day tomorrow, so the party continues on until the band finally calls the last song, even though the crowd wants more. Save for a few photos of the Polynesian dance class and the debut of the Aranui Band in YoYo’s Lido Bar, I did not take a photo or even make a note from Sunday at noon until Monday at 6 p.m. I am not sure what I did during that time other than read, sun, sleep, eat, drink wine, and sip Hinanos. I am sure I chatted with other passengers; learned about where they come from; fumbled with my French; climbed stairs; ate peanuts and olives; drank too much coffee; watched the sunset and sunrise; listened to this voyage’s resident expert and lecturer, Dr. Charlie Love, educate me about the Marquesas Islands; hung out in YoYo’s Lido Bar; and pursued other frivolous activities, but I have no proof to offer. Which is exactly the point. I was relaxing and acting like a passenger on a holiday cruise. I knew by the end of the week I’d be longing for another day like this one. Dinner begins at 7 p.m. each night and generally lasts nearly two hours as people linger over both wine and conversation. A wonderful basket of tender sourdough bread graces the table most nights, along with bottles of wine. There is a salad and soup course that the kitchen and the servers do an efficient job of getting out and across the tables of 150 people nearly all at once. Our main also comes out in close waves—remarkable given that a fine-dining French presentation graces each plate, not a scoop of stew over rice. Plates of dessert filter across the tables in a more relaxed fashion as the wine glasses are refilled. Although the logistical reasons for it are understandable, the one criticism I have is that coffee is not available in the restaurant with dessert. If you want coffee you must head up one deck, grab a cup from the salon, and then return to the restaurant. It’s time to get some rest and get ready for our first port of call in the Marquesas: Ua Poa, the “cathedral island.” We set our clocks ahead 30 minutes, as the Marquesas Islands are one of the few remaining places that operate on a half-hour time zone, 3.5 hours behind the Rocky Mountain time zone in Denver. Note: This trip was sponsored by Aranui 3, Fox Global Communications, Air Tahiti Nui, and Tahiti Tourism Tourism.